Technical risk is the possible impact changes could have on a project, system, or entire infrastructure when an implementation does not work as anticipated. Failure to identify or properly manage these threats results in performance degradation, security breaches, system failures, increased maintenance time, and a significant amount of technical debt for your organization. It is essential to have a reliable analysis solution for technical risk management to ensure early detection of these problems. This will prevent issues from occurring without warning and drastically decrease the required efforts for alleviating sudden infrastructure or system problems. Why Is Technical Risk Management Vital to Organizations? How much technical risk does a current project have in regard to infrastructure security or performance? Are vulnerabilities silently waiting to bring down systems or cause security problems? Automated analysis solutions will help your organization stay on top of these issues. Technical risk control is the process of using methods and solutions designed to quickly identify existing or potential threats of a project or infrastructure implementation. A technical risk assessment performed by an automated analysis solution aids in the early detection of potential issues and can be used to monitor efforts toward eliminating or decreasing the impact of identified problems. Automated code analysis with AIP ensures these items are caught early in the development life cycle and allow organizations to implement improvement efforts to avoid significant problems after a project has been completed. By performing technical risk assessments with automated analysis at the code level, your organization will be able to heighten code quality, remove system vulnerabilities, and drastically decrease development threats. 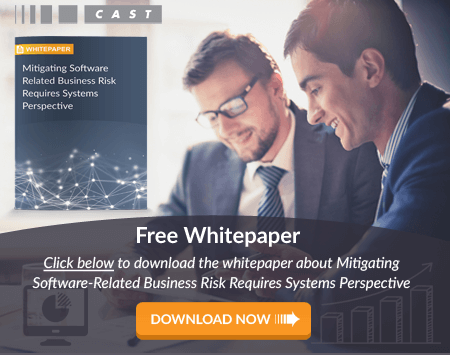 Click here to learn how CAST AIP will help you control technical risk for more reliable infrastructure implementations.